The genesis of the Kalsi Seal product line is the fundamental research performed by the founder and president of the company, M. S. Kalsi, PhD, P.E., while pursuing his masters and doctorate degrees. This research, which commenced in 1968, included both analysis and rotary testing. The end result was a number of important insights regarding elastohydrodynamic lubrication of wide sealing interfaces. During this graduate work at the University of Houston, Dr. Kalsi’s advisor, professor Gabriel Fazekas, challenged him to find a way to use these insights to create a superior commercial product. After founding Kalsi Engineering in 1978, and hiring the first few employees, Dr. Kalsi established the company’s first seal testing laboratory in a nearby rented storefront. The fundamental concepts underlying our initial commercial seal offerings were tested and proven in that modest facility. As sales grew, we were able to build our own office and laboratory facilities, and gradually expand them—always investing a significant portion of our income into continuing our seal research. Kalsi Engineering’s longstanding commitment to continual product improvement has resulted in a variety of rotary seal products that extend performance far beyond that of the first commercial offerings. Our initial research, beginning in 1968, made us pioneers. The knowledge gained from our continuing seal research over many decades makes us industry leaders. 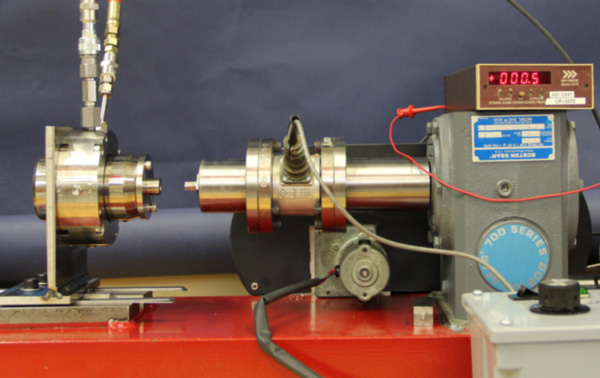 Our current testing facilities include a well-equipped mechanical testing laboratory and a flow loop, in addition to our seal testing laboratory. These facilities are located in Sugar Land, Texas, which is part of the greater Houston metropolitan area. A film observation from Dr. Kalsi’s graduate research. 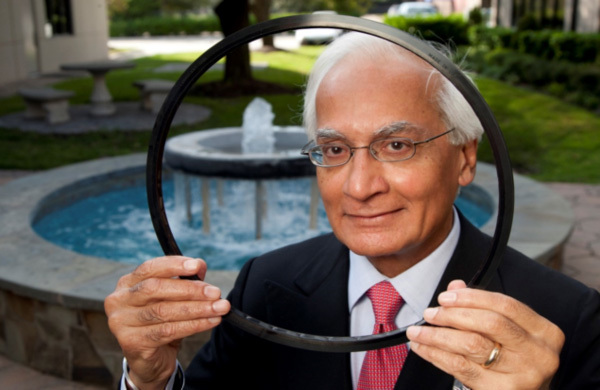 Ever since founding Kalsi Engineering in 1978, Dr. Kalsi has invested heavily in seal research. 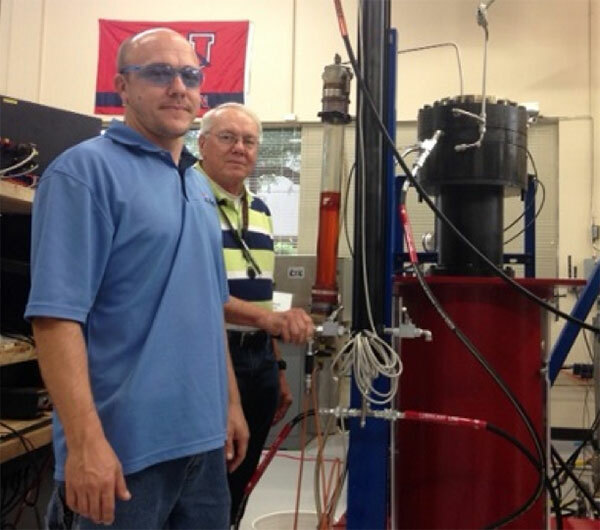 Our seal testing facility is staffed by a test engineer and two technicians. Testing activities are directed by a team of engineers who specialize in rotary seal technology. 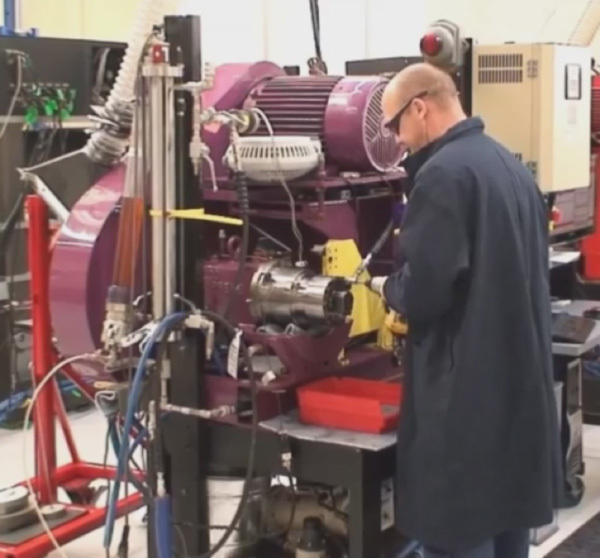 This investment in faculties and personnel allows us to monitor performance of the commercial product line, and develop improved sealing technologies. 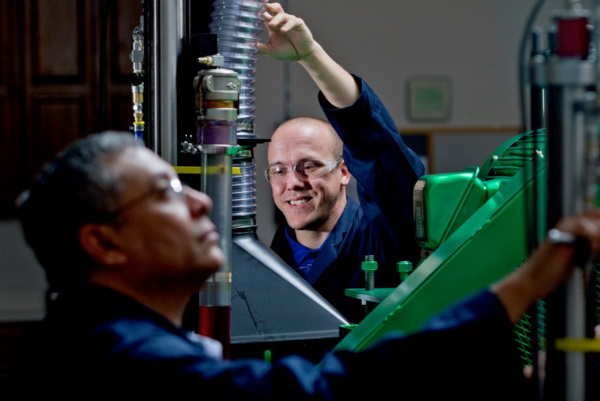 In an average year, we perform over 12,000 hours of rotary testing. 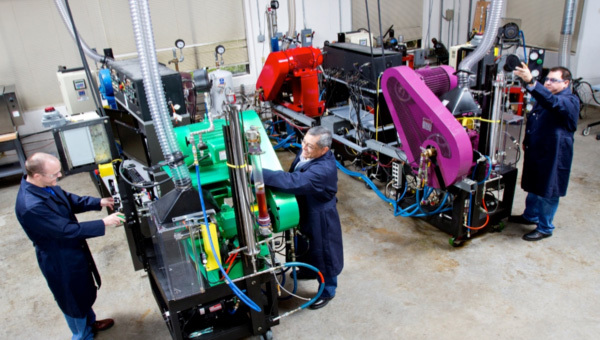 A significant portion of this testing is used to evaluate new seal geometries, materials, and hardware arrangements in pursuit of increased capacity and reliability. We make this huge commitment to testing with the understanding that there is no substitute for real world operating conditions. We know that testing alone can never completely qualify a rotary seal for the demanding applications of our oilfield customers. We also realize that we cannot possibly perform testing for all of the hardware configurations and service conditions encountered in oilfield equipment. However, we are able to significantly reduce customer risk by systematically comparing the performance of new sealing technology to the performance of seals already being used. Our high level of commitment to testing sets us apart from other seal companies. Our seal testing staff, and four of our rotary seal test fixtures. Two technicians at work in the Kalsi Engineering seal testing lab. A battery of horizontal fixtures forms the backbone of our testing program. These fixtures are computer controlled, so they can safely operate around the clock without human intervention. Each fixture typically tests two seals at a time, to avoid imposing axial hydraulic loads on the fixture bearings when the seals are being tested with high differential pressure. These fixtures are instrumented to record relevant temperatures and pressures, running torque, shaft speed, and hydrodynamic pumping related leakage. Temperature controls and environment chambers allow testing to be conducted in various industry-specific conditions. Variable speed electric motors and a range of pulley and belt guard configurations allow testing across a wide range of speeds. While the design of the general purpose seal test fixture is standardized, the fixtures themselves are highly adaptable. The test seals run on interchangeable sleeves that are made with the desired metal and hard coating. 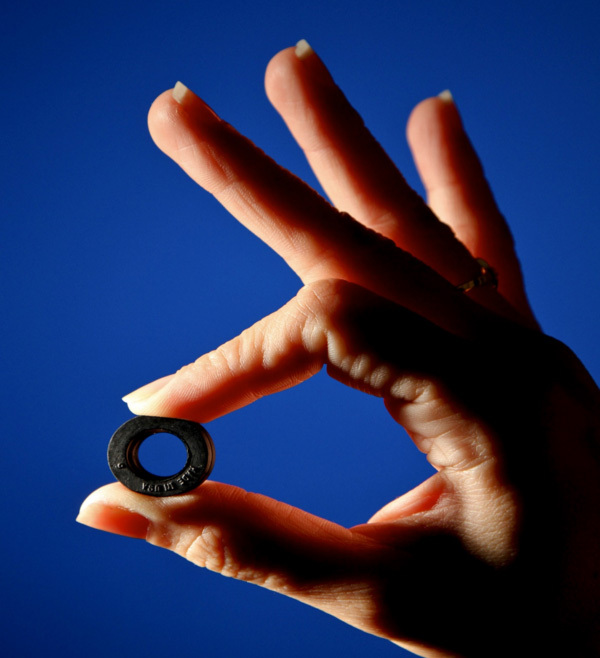 Seals ranging from 1-3/8” to 5.00” in diameter are readily accommodated. When tests require dynamic runout, the test sleeves are manufactured with a controlled amount of eccentricity. The rotary seal test specimens are mounted in interchangeable seal carriers that are designed for specific test conditions. The inherent flexibility and ease of use of our test fixtures has facilitated various rotary seal improvements, and has led to an increased knowledge of the best hardware design practices for various operating conditions. For a video of a horizontal test fixture in action, click here. For a video of a tear-down following a test, click here. Our general purpose test fixtures form the backbone of our testing capability. In this photo, a technician is disassembling a 3,000 psi rotary seal test. This fixture allows full size RCD seals to be tested in high pressure, high speed operating conditions. The convenient modular design of the fixture is adaptable to nearly any high-pressure rotary shaft seal assembly. Kalsi Engineering is one of the few seal companies that has its own fixture for testing high pressure RCD seals. The fixture utilizes a 10.50” diameter mandrel, and can be used with pressures as high as 3,500 psi and speeds as high as 180 rpm. Our comparisons of the pressure and speed capabilities of various rotary shaft seals are more realistic because the test mandrel has about the same thermal mass as the mandrel in an actual RCD. The fixture has been operational since the spring of 2016, and has been used for extended testing of high pressure RCD seals at pressures up to 2,300 psi. It has an innovative modular design that is easy to set up and tear down, and accommodates both fixed and laterally floating seal carriers. Tests can be performed with or without cooling circulation. The fixture is powered by a variable speed 34-horsepower motor, and incorporates an in-line torque sensor. Overall height is kept manageable by a right-angle gear drive. The data acquisition system allows the fixture to operate safely 24 hours a day without human intervention, automatically terminating a test if the recorded data exceeds predetermined limits. The parameters that are monitored include lubricant pressure, hydrodynamic pumping-related leakage, rotary speed, running torque, and lubricant temperature at various locations. This fixture allows rotary seals to be tested while immersed in a flowing high temperature fluid. A special high temperature seal test fixture has been developed to better simulate the thermal conditions encountered by oilwell downhole drilling tools. Such tools are immersed in flowing fluid, and typically have shaft bores that also conduct flowing fluid. Our high temperature fixture continuously circulates a heated thermal transport fluid through the rotating shaft, and around the seal carrier, at a relatively high flow rate. This simulates the thermal environment encountered by the rotary seals of many downhole tools. The test fixture is operated in a fireproof room with a dedicated fire suppression system that allows for safe continuous testing. The room is equipped with alarms and other warning features to prevent inadvertent entry when high temperature tests are being conducted. Conditions inside the room are monitored with a video feed, and test parameters are monitored with a digital data acquisition system. Recorded data includes the temperature of the circulating fluid, the temperature of the seal lubricant in the region near the test seal, differential pressure, shaft speed, and the hydrodynamic pumping related leak rate. 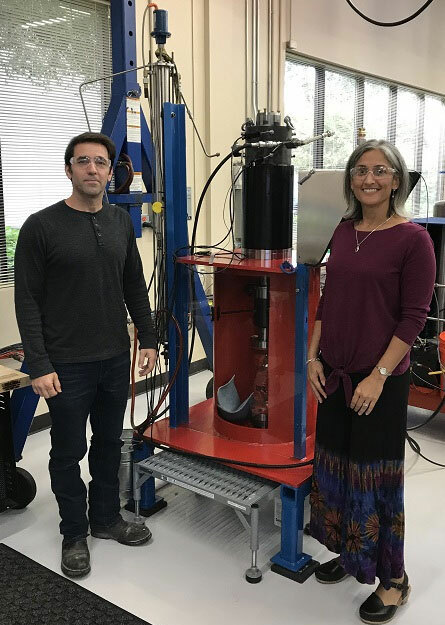 The 4.5” rotary seal test fixture was designed by Senior Consultant Aaron Richie and Staff Engineer Indira Grimes, and uses Aaron’s innovative stacked housing arrangement. This arrangement is easily adapted to testing with or without our patented laterally floating seal carriers. Kalsi Engineering’s 4.5” vertical fixture was developed to test rotary seals in the extreme high-pressure conditions encountered in applications such as coaxial and side entry swivels, cementing heads, and washpipe assemblies. Designed in 2018 for pressures up to 10,000 psi, it has replaced an older rotary seal test fixture that had been in use since 1981. The current fixture was developed with flexibility and ease of assembly in mind, and can accommodate either floating or fixed seal carriers. If desired, fluid can be circulated within the rotating shaft for cooling purposes. Shaft rotation is provided by a variable speed electric motor with a right-angle gear drive, allowing seal performance evaluation over a wide range of speeds. 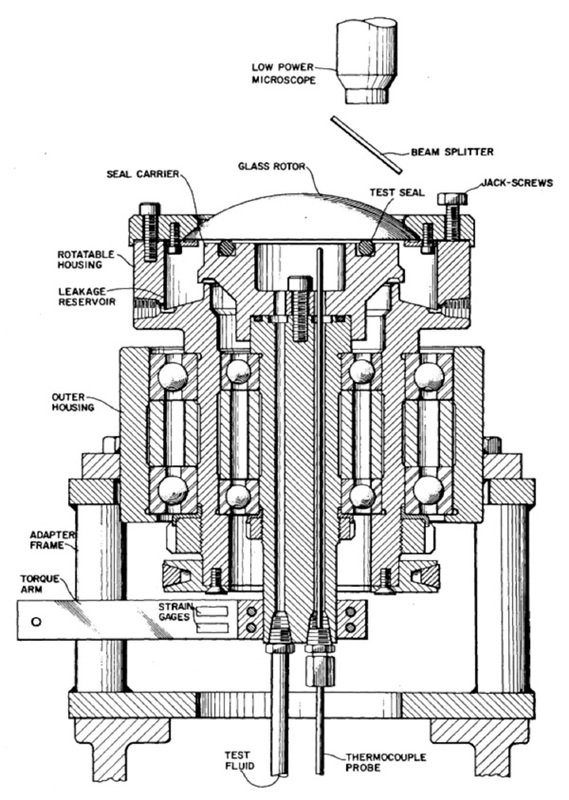 As with our other rotary seal test fixtures, this fixture is fully instrumented, and computer controlled for around the clock unmanned operation. The data acquisition system monitors and records lubricant pressure, rotary speed, running torque, hydrodynamic pumping related leakage, and all relevant temperatures. 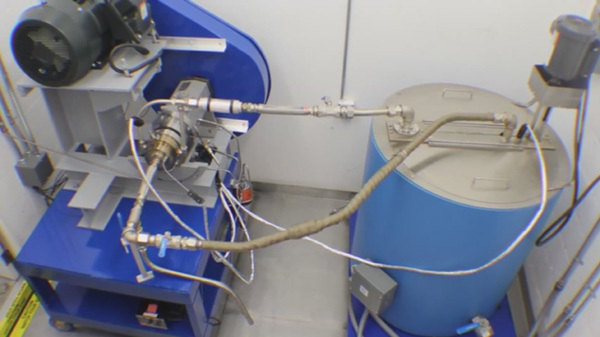 For a video of the previous high pressure rotary seal test fixture in action, click here. For a video of the conclusion of a 7,500 psi, 1,000 hour test, click here. Rotary shaft seal breakout torque testing is highly sensitive to test setup, and to acceleration at the onset of shaft rotation. The greater the acceleration, the higher the measured breakout torque will be. Our breakout torque fixture addresses these sensitivities, allowing rotation to begin slowly and uniformly for consistent results. Seal breakout torque is measured with an in-line torque cell, and recorded by a high speed data acquisition system that captures the instantaneous maximum breakout torque value. The seals are mounted in interchangeable seal carriers, allowing several seal breakout tests to be conducted simultaneously. When desired, breakout torque test results can be obtained at elevated temperature, and with high differential pressure acting across the rotary seals. During testing, the breakout torque is measured soon after assembly, and after a predetermined elapsed time. If a reported measurement time is at the 24 hour mark and the next is at the 48 hour mark, an elapsed time of 48 hours has occurred between the two measurements. This method closely follows ASTM recommendations. This Kalsi fixture measures the breakout torque of rotary shaft seals. A method for dramatically reducing the breakout torque of these 10mm seals was confirmed by breakout and rotary seal testing in our lab. Throughout the life of the company, we have been committed to using, and even developing, the latest analytical software tools. At the company’s founding in 1978, that meant renting time from university mainframes, and submitting punch cards over the telephone lines using a card reader. By 1982, the oil patch was in financial freefall after a string of boom years. Dr. Kalsi saw this drastic economic downturn as an opportunity for consultants, and purchased Kalsi Engineering’s first mainframe computer using 55,000 1982 dollars. This allowed us to rent computer time to other organizations, perform three-dimensional finite element analysis of metal components, and perform axisymmetric analysis of seals. 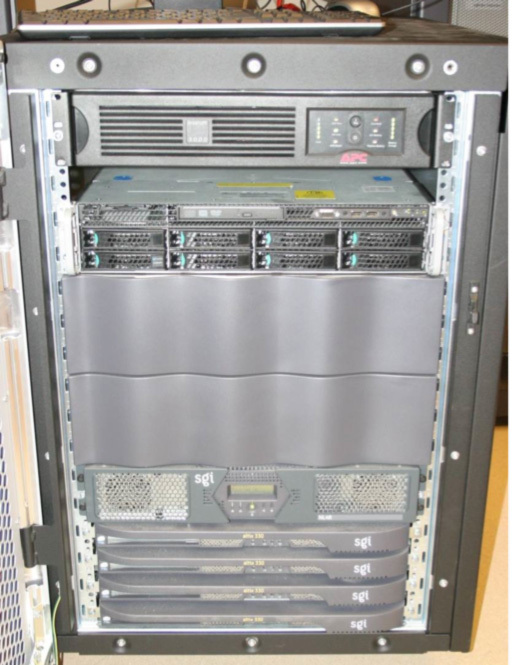 Analysis on this mainframe provided insights that facilitated seal development, ultimately helping us achieve commercial success with some of our early seal designs. This commitment to advanced computing power has continued to the present day. As with every technology based company, each engineer and technician has a powerful work station, and appropriate engineering software. 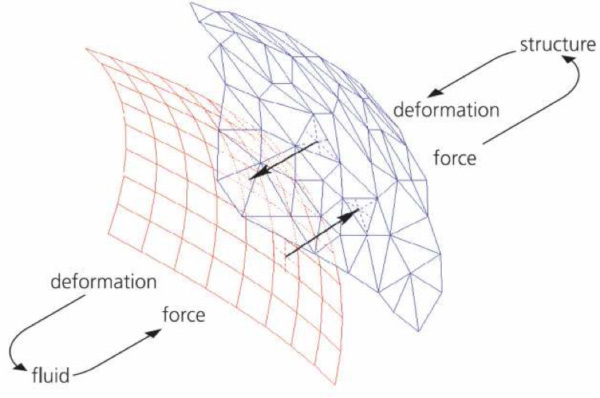 Unlike other typical seal companies, we also have two super-computers for solving complex analytical problems like computational fluid dynamics, finite element analysis with hyperelastic elements, and elastohydrodynamic interfacial film thickness prediction. A six figure super-computer investment, and it doesn’t even come with a keyboard! 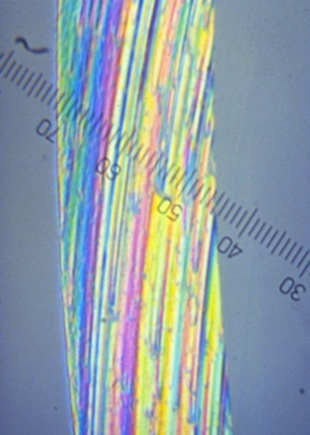 Fluid-structure interaction: Elastohydrodynamic lubrication analysis.